They don't even try very hard to hide it. President Donald Trump, his family and more than a few of his appointees are using his presidency to enrich themselves. They are spending taxpayer dollars for their own benefit. They are accepting sweetheart deals from foreigners. There's a word for this: corruption. A few days after the 2016 election, the government of Kuwait canceled a planned event at the Four Seasons Hotel. It instead held the event — a celebration of Kuwait's National Day — at the Trump International Hotel in Washington. 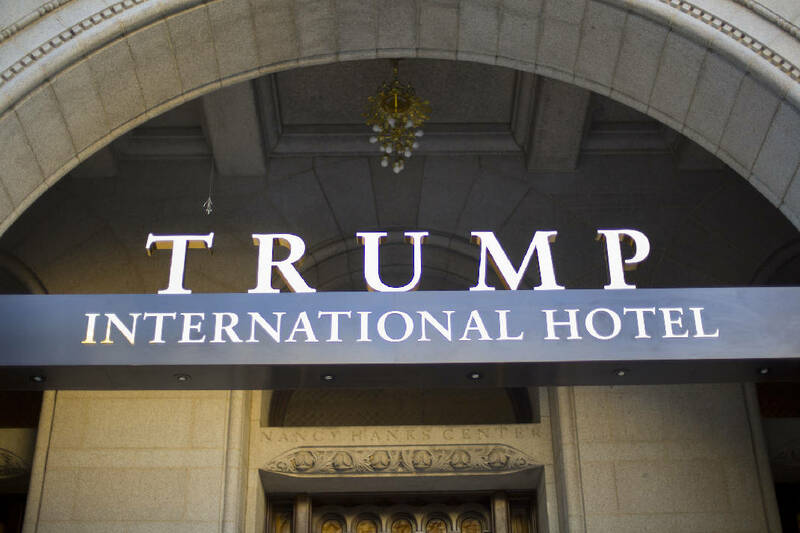 The Constitution forbids federal officials from accepting gifts, known as emoluments, from foreign powers, unless they have received congressional approval. Congressional Democrats have sued Trump for violating this clause, and the case is in federal court. American officials and business leaders have also spent money at Trump properties, sometimes in an apparent effort to please the president. Gov. Paul LePage of Maine last year stayed at the Trump International Hotel in Washington. Other Republicans have held campaign fundraisers and party events at the properties. So have corporate lobbyists. "National Railroad Construction and Maintenance Association Dinner at the Trump Hotel where I am drinking Trump coffee," Sen. Chuck Grassley, chairman of the Judiciary Committee, posted on Instagram last year. During Trump's presidency, his companies have pushed to expand overseas, with help from foreign governments. One example: In May, an Indonesian real estate project that involves the Trump Organization reportedly received a $500 million loan from a company owned by the Chinese government. Two days later, Trump tweeted that he was working to lift sanctions on a Chinese telecommunications firm with close ties to the government — over the objections of both Republicans and Democrats in Congress. He ultimately did lift the sanctions. Trump's businesses have also moved to expand in India, the Dominican Republic and Indonesia, using deals directly with foreign governments. Trump has visited or stayed at one of his properties almost one out of every three days that he has been president, according to both The Wall Street Journal and NBC News. Like previous presidents, Trump travels with a large group of staff and security personnel, and U.S. taxpayers typically foot at least part of the bill for the trips. Unlike previous presidents, Trump is directing money to his own business on his trips. In one three-month period last year, the Secret Service spent about $63,000 at Mar-a-Lago and more than $137,000 on golf carts at Trump's Florida and New Jersey clubs. The president personally intervened in a plan to relocate the FBI's Washington headquarters, apparently to protect Trump International Hotel, which is about a block away. If the FBI had moved, its current site would most likely have been turned into a commercial development, and the long construction process — as well as potential for a new hotel on the site — could have hurt the Trump hotel. Trump stopped that plan, and the White House has instead decided to build a new FBI headquarters on the current site. A report by the inspector general found that officials gave misleading answers to Congress about Trump's role and the project's cost. The Education Department during the Obama administration aggressively regulated for-profit colleges — many of which have miserable records, often taking money from students without providing a useful education. Trump chose Betsy DeVos, a longtime advocate of those colleges and an investor in them, as his education secretary. She, not surprisingly, has gone easy on for-profit colleges. Among other moves, she has reassigned the members of an department team investigating potentially fraudulent activities at for-profit colleges. More than 164 former lobbyists work in the administration, according to the Center for Responsive Politics, including several who regulate the industries that once paid their salaries. The president and his aides have repeatedly shown they are willing to use the government's prestige and power to help their friends and relatives make money. » Trump suggested to Prime Minister Shinzo Abe of Japan during a meeting at Mar-a-Lago in February 2017 that Abe grant a coveted operating license to a casino company owned by Sheldon Adelson, who donated at least $20 million to Trump's presidential campaign. » Ben Carson, the housing and urban development secretary, let his son help organize an official department event and invite people with whom the son had potential business dealings. » Scott Pruitt, the former EPA head, asked his staff members to contact Republicans and donors with the goal of helping his wife find a job. Pruitt also rented a condo on Capitol Hill for $50 a night, well below market value, from the wife of an energy lobbyist whose project the EPA approved in March. Pruitt's many scandals led to his resignation in July. » Elaine Chao, the transportation secretary, used interviews with Chinese and Chinese-American media to raise her father's profile. He is a shipping magnate whose business transports goods between the United States and Asia, and he sat next to her during the interviews. » And although it doesn't quite rise to the same level of the other examples here: White House staffers receive a discount of up to 70 percent on Trump-branded merchandise at the president's Bedminster, New Jersey, golf club, reportedly at the president's recommendation. » Tom Price, Trump's first secretary of health and human services, epitomized that form of corruption. Trump chose him despite his history of using his seat in Congress to make money. Price had a long record of putting the interests of drug companies above those of taxpayers and patients — and then investing in those drug companies on the side. » Brenda Fitzgerald, former director of the Centers for Disease Control and Prevention, committed a more mild version of that sin. She purchased shares in food, drug and tobacco companies after taking charge of an agency that regulates them — and that aims to reduce smoking. After her purchases became public, she resigned. » Finally, Wilbur Ross, Trump's commerce secretary, has mixed government business and his own business in multiple ways. He held on to investments — and then appears to have lied to government ethics officials about those investments. He shorted the stock of a company about which he appeared to have advance notice of bad news. He also met with the chief executive of Chevron, even though his wife owned a substantial investment — which, according to Forbes, "put himself at risk of violating a criminal conflict-of-interest law." » Michael Cohen — Trump's former lawyer and fixer, who has since turned on him — received at least $1 million from AT&T, Novartis and Korea Aerospace Industries shortly after the 2016 election. They were supposedly paying for his insight into the Trump administration. » Corey Lewandowski, the former manager of Trump's campaign, is paid for work that looks very much like lobbying — such as participating in a lobbying firm's phone calls with clients and doing work on behalf of T-Mobile, the telecommunications company firm. But Lewandowski has not registered as a lobbyist and says he does not need to do so. » Paul Manafort, Trump's former campaign chairman, reportedly used his position to offer private briefings to a Russian oligarch to whom he owed millions of dollars. Manafort saw the briefings as a way to "get whole." The biggest scandal of all, however, is not even the corruption of the Trump administration. It's the inaction of Congress. The founders were well aware that the government they were creating could end up with corrupt or unethical leaders, all the way up to the president. That's why the Constitution gives Congress tremendous power to investigate and even remove officials in the executive branch.